Happy birthday, U.S.A.! At the backyard barbecues and summer socials we attend on this American holiday, people share potluck side dishes and desserts at the host’s home. We usually contribute a flag cake but sometimes it is too filling and heavy. 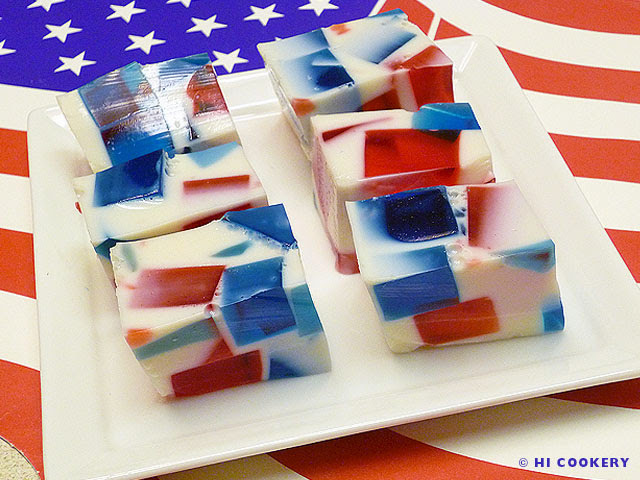 So we bring “Broken Glass Jell-O” in patriotic colors (red, white and blue) instead because it is lite and cool. The recipe is easy and versatile—change the colors of the Jell-O to reflect the holiday (orange and lemon yellow for fall; strawberry or cherry red and lime for Christmas; etc.). Nosh on this nostalgic dessert on July 4 (American Independence Day) and also on July 12 (Eat Your Jell-O Day)!!! 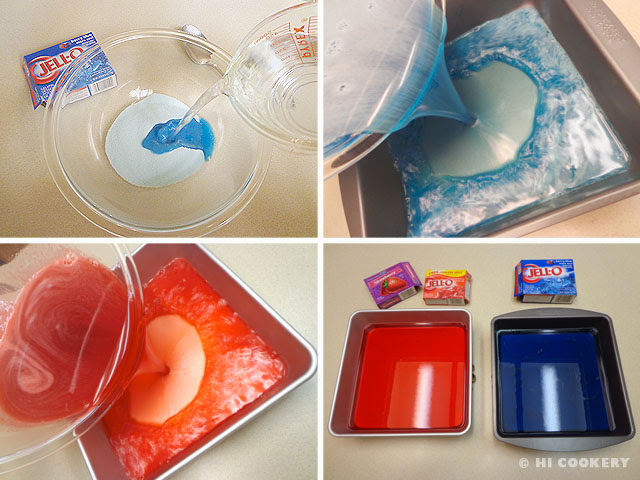 In a bowl, dissolve the blue Jell-O in 1 cup of boiling water. Stir well. In another bowl, dissolve the red Jell-O in 1 cup of boiling water. Stir well. Pour each into two 8-inch square pans. Cool to set in the refrigerator. In a bowl, dissolve the unflavored gelatin in 2 cups boiling water. Stir well. 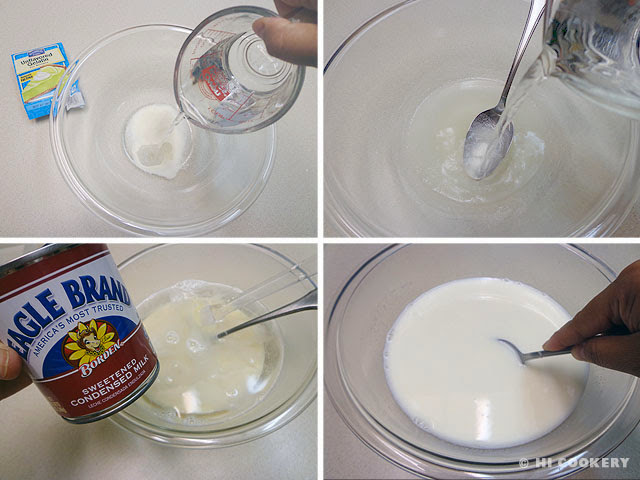 Cool slightly then mix in the condensed milk. Then cool completely at room temperature (do not refrigerate yet). 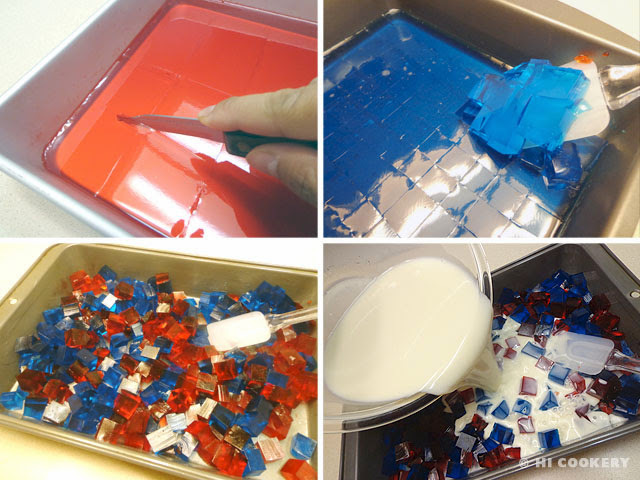 Cut the blue and red Jell-O into small squares. Place in a lightly greased 9×13-inch pan. Pour the cooled milk mixture over the Jell-O squares. Refrigerate until firm. Slice into 24 blocks. Arrange on a platter and serve chilled. Thanks to Phyllis S. for sharing the recipe with us and gifting us with a Jell-O cookbook, “The Magic of Jell-O,” which has additional recipes for Jell-O desserts. 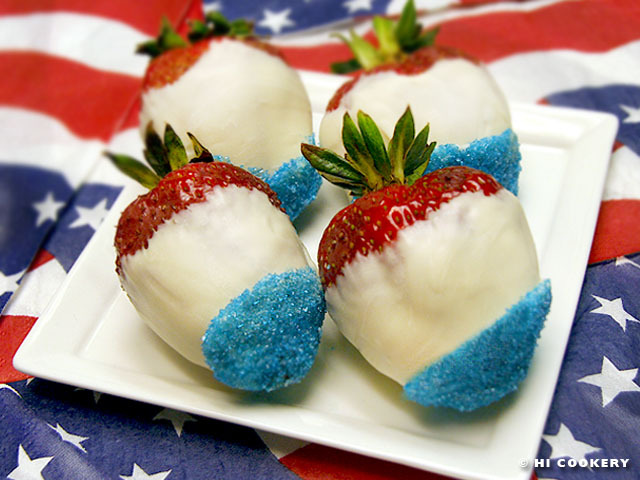 Search our blog for other patriotic and Jell-O recipes. Happy birthday, America! People are especially patriotic today and traditionally celebrate the country’s independence by watching parades and fireworks; stimulating the economy by shopping at the sales; or spending time, relaxing and feeding our faces (of course!) with family and friends. On this national holiday, we usually grill burgers and hot dogs or barbecue spare ribs, steaks or chicken. Sometimes we also prepare a patriotic parfait or American flag cake. Today we tried a simple sweet treat featuring red strawberries, white chocolate and blue sanding sugar for a cute red-white-and-blue dessert as a festive Fourth of July food! Wash and dry the strawberries. 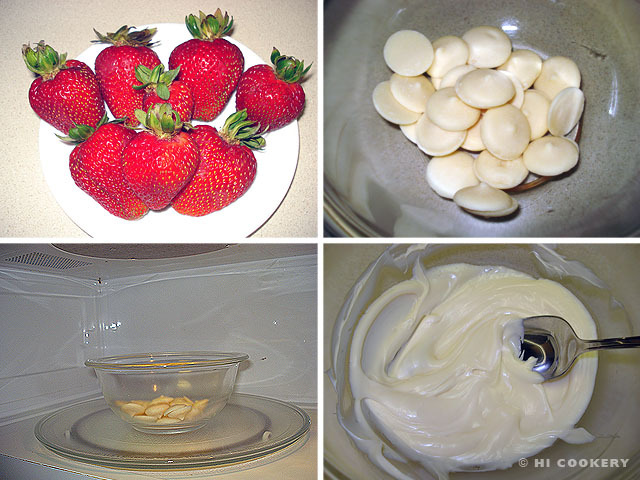 Melt the white chocolate or vanilla candy wafers in the microwave as directed on the package. Stir until smooth. Dip each strawberry two-thirds with the melted chocolate or vanilla candy. Place on waxed paper to set slightly. 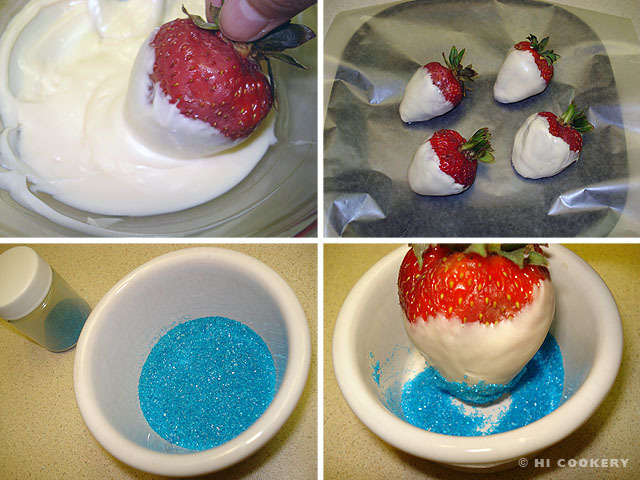 Before the coating hardens, generously dip the bottom third of the strawberry into the blue sanding sugar. Place on waxed paper to set completely or display in mini-paper cupcake/muffin cups. Strawberries should be at room temperature for dipping or they will “sweat” after cooling. White chocolate or vanilla candy wafers may also be melted in a double boiler. It is best to prepare the red-white-and-blue strawberries on the day of the meal or as close to serving as possible for freshness. The strawberries tend to leak some juices and the coating melts in higher temperatures. Refrigerate to solidify the coating as necessary. Search our blog for more festive Fourth of July foods.